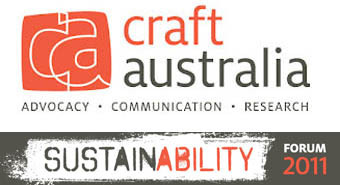 ‘Sam Parsons: Musing on a Sustainable Practice’ was a special feature on the Craft Australia blog in 2011. “As a designer I grapple with questions like these on a constant basis. I am consequently committed to designing solutions that have real purpose, respond to everyday needs, are adaptable, contribute to the quality of life, can transcend transient fashion and importantly challenge society’s ‘throw away’ mentality”. Thank you Belinda for inviting me to participate. 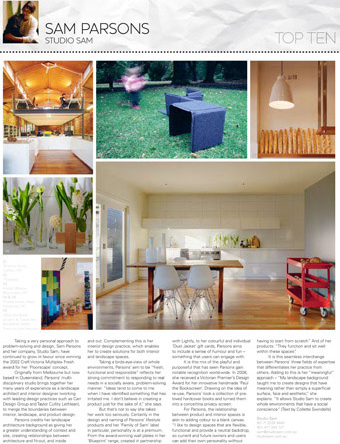 The article features the Elsternwick home of creative pair Dean and Tanya Cherny. Dean has been an “avid art collector” for 13 years. A Mini Bookscreen is in some great company with paintings by David Bromley and Tim Storrier. The “house relies primarily on a white palette, but strong colour is introduced in dramatic artworks and accessories”. 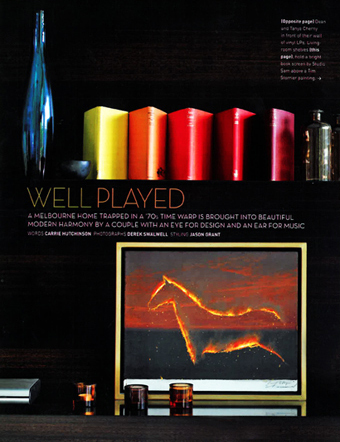 The Mini Bookscreen’s bright colours pop on top of a custom designed, dark timber shelving unit in the living room. 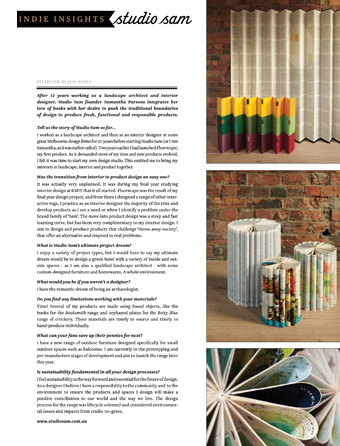 We felt very privileged to be interviewed by this sustainability focussed magazine who showcase “the best in eco and handmade design from Australia and the rest of the world”. Sam heard Kelley Sheenan the editor/publisher present at Bubble and Speak in 2010 and really admired her work and commitment to sustainability. Anne-Maree, with an ongoing quest for unearthing originality, identified Sam as one of five Australian designers “who’ve got the goods”. The 4 other designers included Alexander Lotersztain, Trent Jansen, Tomek Archer and Simone LeAmon. 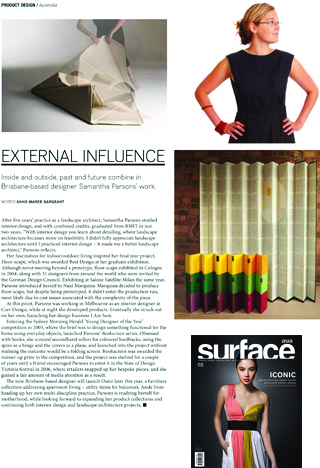 The article was included in a special feature showcasing 20 emerging Asia Pacific designers. Dana from the design blog, Yellow Trace, interviewed Sam and asked a range of interesting questions including: What you are seeking to portray in your work? What is fundamental to your practice – your philosophy and your process? What are some of your methods to staying motivated, focused, and expressive? Apart from your work, what other interests or hobbies do you have? What is your most treasured belonging? link please read the interview to find out my answers! 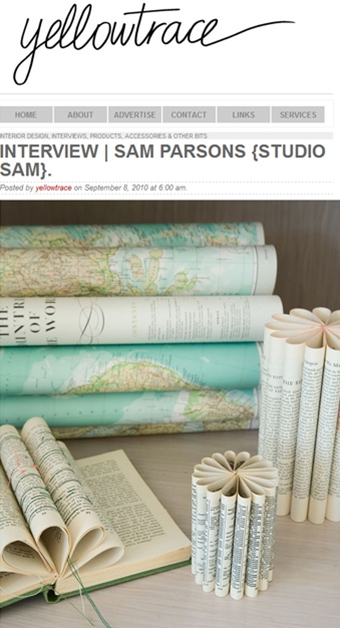 Thank you Dana for including Studio Sam on your inspiring blog. I really enjoyed the interview and sharing some different information about myself and Studio Sam. Each year DQ (Design Quarterly) magazine selects a group of 10 people “across myriad fields” that they feel “have achieved outstanding results in their practice”. We thank them for including Studio Sam in their 2010 selection. We love this styling and photography by Vanessa Colyer Tay and John Dennis respectively featuring our Mini Bookscreen. 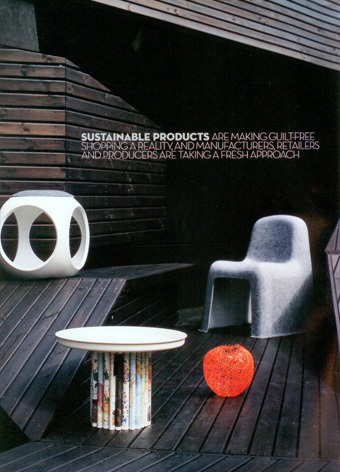 We were grateful to be included in a special feature on Australian Designers in this international magazine. Even thought this photo is 10 years old now we think it has stood the test of time!